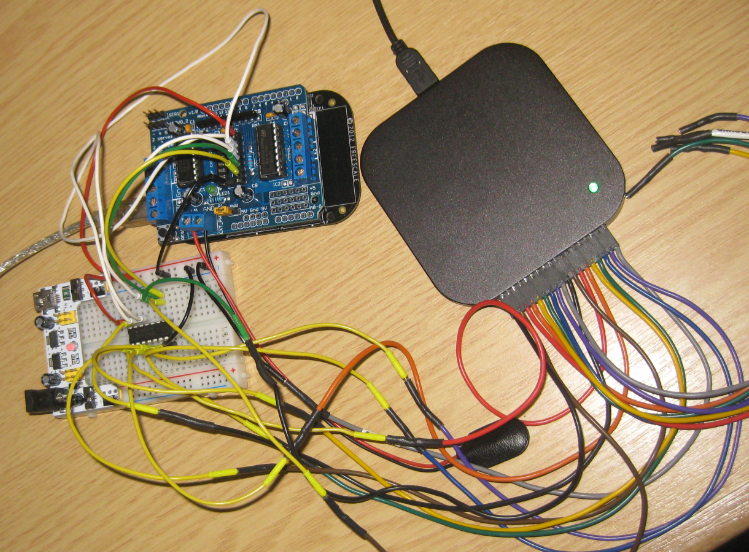 For many projects, I have one common problem: I run out of I/O pins on my microcontroller :-(. Luckily, I’m not alone, and the industry has created solutions for this kind of problems. 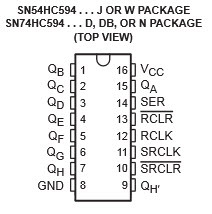 One is to use a shift register as the 74HCT595/SN74HC595 which gives me 8 extra output pins. All what I need to spend are are 3 GPIO pins. Not a bad deal: I spend 3 pins and I get 8 (or multiple of it) on return :-). SER: Serial input pin. Using this pin, data gets shifted into the device. Sometimes this pin is named SD (Serial Data). RCLK: Clock to store or latch the shift register content in the device. This pin is sometimes named ST_CP (Store Clock Pulse). QA..QF: 8 output pins of the device. Named as well Q1 to Q7. QH’: Daisy chain pin. Using this pin, multiple 74HC595 devices can be chained. Sometimes named Q7′. I can chain multiple 74HC595, and then I get 8, 16, 24, etc output pins. An excellent tutorial how to use it to drive 16 LEDs (or more) can be found in this article. In this article I’m using just one device, but it is really easy to chain multiple 74HC595. The Eagle Schematics and layout is available on GitHub here. 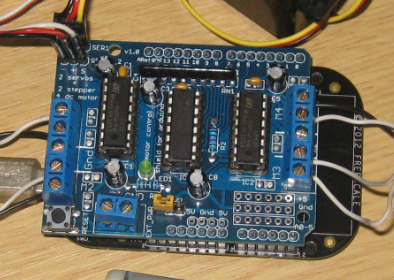 The 74HCT595N on the Arduino Shield is used to drive 8 motor bridge pins (M1A, M1B, M2A, M2B, M3A, B3B, M4A and M4B). It uses the DIR_EN pin to enable the device. The Ardunio Motor shield schematic is using ‘DIR’ as the signals are used to change the motor direction signals. More about this in the next tutorials. If I have the devices chained, then the D7 bit would be shifted into the next device through the ‘chain’ pin. The macro HC595_SHIFT_MSB_FIRST is used to either shift in the most significant bit first or the least significant one first. The method ShiftByte() only shifts the 8bits, and does not latch them to to the output pins. So I can use several times the ShiftByte() method if I have chained shift registers. 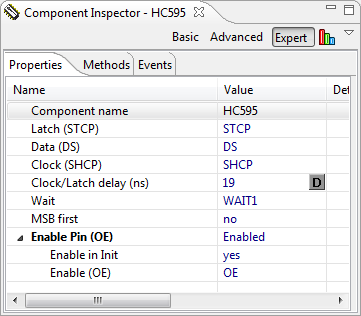 To make usage of a 74HCT595 really easy, I have created a Processor Expert component for it. It is available on GitHub with instructions here how to download and install the components. It specifies the interfaces for the mandatory Latch, Data and Clock pins. The OE (Output Enable) pin is optional. 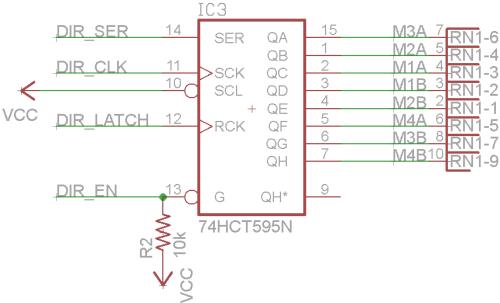 Depending on the type of HC595 there might be different delays needed for clock and latch, so the component offers to specify a delay in nanoseconds. ReadByte() returns the latched value. For this it uses a cached (local) variable. WriteByte() does the shifting and latching for a single byte in a single method. Shift registers are very useful to expand the amount of pins of a microcontroller: with a few pins it is possible to have many more pins. 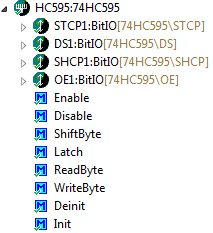 Writing a driver for it is not difficult, and I hope the 74HC595 Processor Expert component even makes things easier. As always: the sources are available on GitHub. 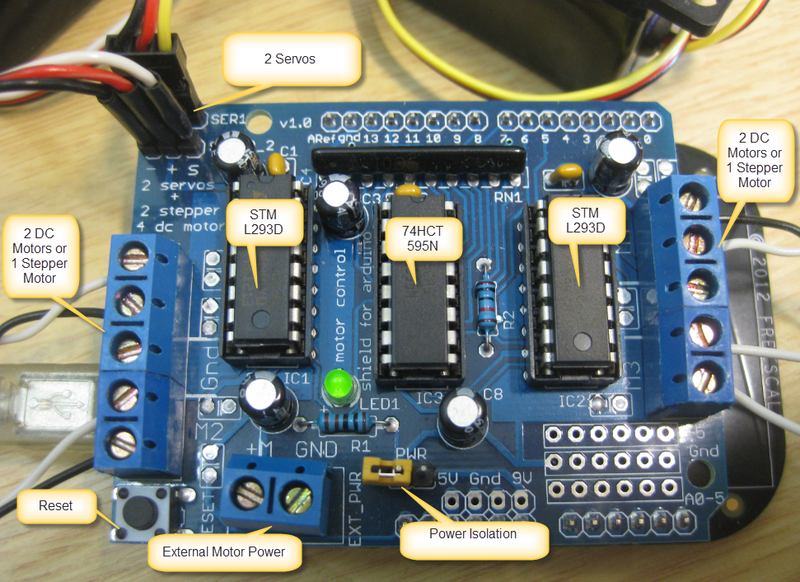 This entry was posted in Embedded, Kinetis, KL25Z Freedom Board and tagged Embedded Component by Erich Styger. Bookmark the permalink. This worked, have you ever done microstepping? Ok, sure I also have a lot to write but no time as I am experimenting. I am using stepper motors from cdroms to build X-Y platform for application in some kind of imaging that requires shifting. DO you know which connection on the stepper motor shield is DIR for changing direction. I cant find anything about that. #define MOTORLATCH 12 // I want change this pin 12 for 0, 1 or 2. I want to change the pin 12 for another pin. I want to do it, because in my project I need to use this pin 12. I have free the pins 0, 1 e 2 of the my Arduino. you need to check the schematics of your board if this is possible at all. Guys, can anyone send me a simple code to run the dc motor. I tried but not very sure how the ports need to be set. I followed the instruction above to set all the ports for the Shield.